Two weeks ago, I had a short discussion with a colleague. 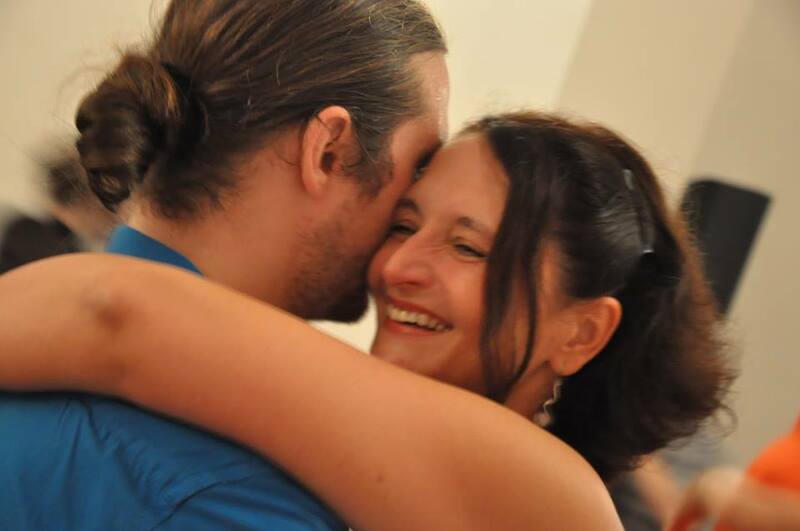 He used to be a very famous Tango performer and is now teaching mainly in Germany. He was quite surprised when I told him, that I do not perceive myself as an artist. Of course not! An artist creates something unique in order to present a thought, an idea or a feeling to an audience. A Tango artist may dance a choreography or at least improvise for an audience, driven by this artistic motivation. I don‘t do that. Of course Detlef and I do demos and have a distinctive style of movement and musical expression. And we may even create something new whilst dancing. But every social dancers does it, when he or she really improvises. When we do a demo, we just want to show people, how social Tango can look like and what they can expect to learn from us. That‘s not the motivation of an artist. I am not even a dancer. Why? Although I‘ve danced all my life, I never aspired to do this professionally. I do not own a dance diploma and I do not earn my living by dancing or doing performances. Most of my time, I spend at the computer, organising, planning and reflecting classes or writing about Tango. I spend a lot of time sitting in cars, train and airplanes and of course several hours per week teaching Tango. I spend much less time actually dancing Tango. Those who have read my previous posts, may have figured that out already and know the numerous reasons why. To call myself a dancer would be presumptuous. But I am no artist and I am no dancer. I dance Tango, because I love it. Just for the fun of it. Tango cosmopolites - or not? Tango is an international phenomenon. Nowadays, you can find Tango all over the world, from South Africa to Finland, from California to Japan. If you want to dance nicely, you don‘t have to travel to Argentina - you find great Milongas & Festivals everywhere. You will meet people, dancing to traditional music, respecting the codes of the Milonga and having developed a great new Tango combining the close embrace of the elders with the gift of real improvisation, deriving from the innovators. Tango is a product of an international exchange, that started around 1900 and that is still happening all over the world. I even want to go further and postulate, that in order to understand modern Tango, it is not enough to stay in your hometown and save all your money for the important trip to Buenos Aires. No, to really get Tango, you have to embrace the world! So, experiencing an international process of evolution, I‘m always surprised to encounter national narrow-mindedness on the one hand and over-glorification of all that‘s argentine on the other hand. Here I am again, breaking a tabu. Tangueros are supposed to worship the Argentinean gods, but I don‘t. But what can I do? I was born in England and mostly grew up in Germany as the daughter of a German mother and a Spanish father. We spoke German, Spanish and - even more important - English. Lots of our friends were Americans, because my parents worked as travel agents for the american military and their families. As a child, I travelled a lot and got to know different cultures and people and I learned several other languages. Today, I study European history and literature. I perceive myself as an international creature and am therefore very sensitive to shows of national superiority, wherever they manifest. In my first years of dancing Tango, I heard a lot of great stories about Buenos Aires. Although I‘m not easily impressionable, I was spellbound by the anecdotes of my German teacher, depicting all the phenomenal dancers, shiny Milongas and larger-than-life demos. In 2004 (I was teaching Tango since 2001), Detlef and me set out for our first trip to Buenos Aires. We visited the usual Milongas, danced with the porteños, where invited to do our first demo at the Confiteria Ideal... all very nice. But: I was definitely not overwhelmed. Apart from noticing a big concentration of top dancers, the average dance-level* at the Milongas was usually not very impressive and very often, the foreigners even raised the bar. I have to admit, that in 2004, many argentine dancers knew the music better and were more accustomed to navigate on a crowded dance floor. Do not misinterpret me here: I love dancing in Buenos Aires: They‘ve got the tradition and it‘s great, to experience the special ambiance of an original Milonga. But still: My favourite partner was an Italian. And there they were: all those guys who tried to impress me with their grasp and wanted to sell private classes to the gullible tourist. And this was just a side-phenomenon of a greater notion: the idea that, no matter how little he knows, an argentine will understand Tango better than all those foreigners. And although nowadays many argentines acknowledge the broad understanding and high development of non-argentine dancers, the myth of the super-human Maestro still lingers. No matter that a lot of the European or North American dancers developed a inferiority complex, manifesting in the most ridiculous ways: teachers making up false Spanish names and identities, students worshipping their Maestros and willing to pay 300€ for a private class, people plastering their walls with panoramas of the Iguazu falls and trying to drop Spanish words into every conversation to show: I‘m one of you! Listen up: You‘ll never be an argentine, unless you give up your original nationality and move to Buenos Aires for good. And even then... But that‘s actually not important! To become a good Tango dancer, you don‘t have to ape argentineans. You have to dance and study Tango, wherever you find it and with whoever you think can teach you best, no matter which nationality he or she has. The Germans! They are the boldest admirers of foreign cultures and lots of them speak several languages, one of them usually being English. Many get real enthusiastic and I already have to endure the tendency to glorify Argentina ... But now a reverse-problem seems to manifest. It‘s about language. I‘m used to French or Spanish people complaining, when you do not use their national idiom. Few of them they speak other languages, so I try my best. But I will use English as my default-language when teaching in other foreign countries, I use it on Facebook, on Youtube and I blog in English. Our Tangokombinat-site is now purely English, as our events attract an international crowd. Sometimes I even send an e-mail to our mailing list purely in English, when I do not have the time to translate it in French and German as well. And now the Germans are complaining! Since about two years, several German Tangueros annoy me with comments on our Youtube videos, mails or now even on my blog. These are people who complain that I do not use German as my official language. What? German chauvinism in the Tango community? That‘s really more than I am willing to stand. As I said: Tango is international. Get used to it! By the way 1: I wrote a paper on "Tango as a product of international exchange" for my history studies. It's unfortunately in German, so it does not make sense to publish it here. Sorry. * As an explanation and response to several comments: when talking of "dance-level", I do not refer only to technique or complexity. A high level in dancing especially manifests in a nice embrace and rich musicality: the "feeling". BEFORE you write a commentary on my text and start raving about bad Melina denouncing Argentine culture, please read again. I am NOT advising people against dancing in Buenos Aires and learning with the argentine teachers. I am just speaking out against over-glorification and thoughtless imitation. Get it? Walking through mud and dancing on a volcano! You may have noticed, that I'm rather the critical type. I usually write about the things worth complaining in Tango. But there's also lots of good stuff and on Friday, I've experienced another great example of Tango solidarity and commitment. We were on our way to a local Milonga in Wiesbaden (Milonga Orillera) and actually happy about the rising temperatures of the last few days. When approaching the site, a sign appeared, telling us, that the way to the Milonga was flooded and that we had to take a detour by food to access the place. Obviously, the waters of the Main had also risen! I have to admit, that I would have turned around and gone to a restaurant, had we not agreed to meet our host of this weekend's workshops at the Milonga. Although I really appreciated it, that Michael of the organising team lead the way by bike through the deserted area, I was rather annoyed. I grumbled along the muddy riverside way, trying to keep my feet dry. We really did not expect more than a dozen dancers. I was surprised to find a full-blown Milonga with around 80 Tangueros crowding the dance floor. The atmosphere was warm and every guest was greeted like a long-missed friend having made the effort to come! All knew, that we might be stuck there, as the waters were still rising and our way back might be obstructed my the flood as well. It was like dancing on a volcano and we stayed until the end, ignoring the pending doom! And we had been right: on our way back, the waters were knee-high. But the organisers had provided for help. After their self-constructed catwalk had collapsed, they arranged for a shuttle service: one of them was driving the visitors with his mini-van through the waters, risking to be stuck in the mud. So, thanks to great organisation and kindness, we arrived in dry territory without wetting our feet. Well... almost... As I mistook a shining surface of water with asphalt, I managed to drain my boots. That's so me! It's a job - for god's sake! Teaching Tango is a great thing to do. You get to know a lot of people, make friends, explore an interesting culture and you receive a lot of positive feedback and self-affirmation. Enough reasons for quite a few to give up better paid and secure jobs. It‘s about following a dream. And those who manage to make a living out of it are perceived as particularly blessed. We few, we happy few! But the job is not without disadvantages and what I want to focus on, is a specific characteristic of occupations in the recreational field or the arts. I am referring to the fact that teaching Tango, as a result of it‘s merits and because of the friendly relations you make, is widely not perceived as a real profession. Very often this results in unprofessional behaviour by teachers, organisers and consumers. Already within the first months of dancing Tango, I was surprised by the amount of unprofessional comportment on the side of the teachers, some of them obviously some kind of stars: coming too late to class, not being prepared, fighting in front of the students, insulting customers... You all know, what I‘m talking about. So when I started teaching and organising events, I wanted to do better. But although I was behaving correctly, my job was not taken seriously by all of my customers. The participants of our regular courses e.g., did not understand, why I might be tired after class and wanted to go home, instead of spending the rest of the evening (and most of my earned money) in a restaurant. Some of them, even made me feel bad about taking money. And I still remember them wishing us a „happy holiday“ when we were about to start our first tour to the USA. What? Running to catch a Metro in New York after hours of privates to get to a pre-Milonga class without having had dinner is definitely no holiday! There are far too many out there, who do not understand the following: The moment, money is exchanged for a service, you are dealing with a professional situation and you have to behave according to it. And because I‘m obsessively correct, I decided to compose a list of „do‘s and don‘ts in Tango-teaching business“. An incomplete handbook. Ein kleiner Leitfaden. It is adressed to teachers (both travelling and local), organisers and students. People pay money, so that you help them to learn Tango or inspire them with a show. You are an employee or at least a person who renders a service. You are entitled to a fair payment and correct behaviour on the side of the organisers and students and to whatever additional compensation that your contract with the organiser agrees on. Be clear in your communication with organisers. Respond to their mails or calls and give them whatever information they need to prepare the event. If possible, provide a pre-written contract or at least a paper with your conditions. Prepare an invoice. Prepare instruction thoroughly. Knowing a step is not sufficient. You have to know how to structure a class, to initiate exercises and to be able to explain whatever is necessary to understand your concepts and ideas. It‘s called pedagogy. You can study it at universities, in case you are not yet properly equipped for the job. If possible and necessary, learn languages to communicate with your customers. Nobody will expect you to speak French, if you go there for one Festival only. But if you are invited repeatedly, you may want to learn a few terms in order to facilitate your instruction. Do not drink or take drugs before or during classes or Milongas. It‘s likewise not cool to come to class with a hangover from yesterday‘s night out! Be polite to your customers and employers. During classes, give personal feedback and help to students. It is not enough, to show a step and then sit back to drink Mate. Do not bring your children to a gig, definitely not to class. They will distract you. If you teach social Tango, behave socially at a Milonga: It is not cool to sit and dance only with your colleagues or buddies. Do not think, that you're too good for the civilians. If you have to, please refuse invitations to dance or to communicate in a polite way. Prepare the music for your demo and co-ordinate early enough with the DJ, so that he/she can plan accordingly. Having fun at a Milonga is one of the perks of your job, but do not overdo it. It‘s possibly not a good idea to stay until the end of an all-nighter, if your next class starts early the next day. You‘ve got a job to do! People give you money, so that you hire teachers or organise Milongas and Festivals. You are an employer or at least an agent. You are entitled to a service as described in your contract with the teacher/artist and a complete payment by the final customers. Be clear in your communication with the teachers and students. Respond to their mails or calls and give them whatever information they need to prepare for the event. Post complete info on the net with whatever details might be relevant. Announce your events in due time. A good and early publicity is the pre-requisite for a successful workshop, festival or Milonga. Half empty classes are bad for your budget and for the general morale! Do not overbook classes and try to keep class sizes reasonably. Every student above 12 couples will minimise the teaching quality, as it does not allow for enough time to correct each student individually. Be punctual and organise enough helpers, if needed. Do not forget to arrange breaks in the class schedule. Provide correct lodgings for the teachers. They will need a bedroom with enough space to store their clothes and an appropriate bed or beds. A private bathroom is good and lodging the teachers in a hotel is even better. Tango teachers are sociable people, but many of them travel the entire year and will need some privacy. Provide food and drinks according to the needs and tastes of the teachers. They will work hard, so they need proper nurturing. Lots of Tango teachers travel all year. They will most likely not have the time and energy to do sight seeing. If you nevertheless suggest it , please accept a „no“ without being hurt. Pay teachers fairly. It is not Ok to overbook classes with 20 couples, and in the same time try to keep the salary of the teachers as low as possible. It‘s totally acceptable to aim for a profit, but the income should at least be shared 50/50. Teachers who work on a shared-income basis and not on a fixed salary, will might even ask for a share of 70%. Announce demos properly and try to cheer up the audience. Performers need an alert and eager audience to do their best. You pay the teachers and organisers to provide a sound education or amusement at an event. You are a customer. You are entitled to a service as described in the announcements and furthermore a polite and proper treatment by both teachers and organisers. No matter how good you know the teachers, give them some privacy. Do not crowd them during class breaks or at Milongas. They might want to prepare or just need some time-out. Sitting in the corner with the feet up and eating a sandwich does not signalise: I want to have a chat! Show up for class. If you've pre-booked a class and cannot come, please cancel early enough, so that the organiser can give your place to someone else. During class, do not interrupt the teachers without a show of hands and do not chat during their explanations. It‘s likewise impolite to leave the room for a longer period without explaining why. Please do the exercises that you were asked to do. If you do not understand them, ask the teacher. If you do not agree, explain why. Accept corrections without moping. It‘s the teachers job to give feedback and if you feel, that you do not need instruction, please do not attend a class. Do not idolise a teacher. You‘ve got the right to question his or her concepts and didactics. If you feel, that something does not make sense or if you do not share an opinion, you may say so politely. If the teacher does not behave in a civilised manner, comes to late or doesn‘t do his job properly, complain with him/her and with the organisers. Ask in advance, if it is allowed to videotape the class summary or demo. Do not post it on Youtube without permission. It is permitted to invite teachers to dance, but please do it respectfully. Collecting dances with „Maestros“ is purely stupid. Use cabeceo & mirada to express invitations and accept a „no“ if given. Apart from being tired, a teacher may have the same reasons to accept or refuse an invitation as anyone else. You pay teachers for instruction, but they are no taxi-dancers. When inviting a female teacher to dance, do not try to impress her with all the great steps you‘ve learned. She will definitely be bored or annoyed. Dance simply, musically and with a nice embrace and she will love it. Do not mistake an intimate teacher-student-relation with a real friendship. Making friends with a teacher takes time and requires personal exchange - as it would with anyone else. I‘ve made a quite few friends amongst students and organisers, but these are the relationships that transcend Tango and this article.